I had grand plans: Wake up at 6 AM (an ungodly hour for any self-respecting retiree) and head out of Guadalupe Mountains National Park, turn south for two miles to hit the scenic overlooks of El Capitan, find three or four geocaches along the way, and then turn back north to meet our 8 AM appointment at the Carlsbad RV Repair Center to address a couple of water leaks. Rosie did not object as she planned to stay in bed during the entire scheme of manuever. What I failed to take into account was the sunrise time; at 6 AM it was still pitch black, and I don’t like to drive The Big Kahuna in the dark, much less try to geocache by flashlight or sight see without, er, sight. So I reset the alarm for 6:40, which turned out to be perfect for a dawn start with sufficient light to both see El Capitan and find at least one geocache before we headed towards Carlsbad. We arrived at the repair center precisely at 8, they immediately lead us into a bay, Rosie and I walked down the road to a diner for breakfast, and by the time we returned they were already buttoning things back up after repairing the two fitting cracks we knew of plus a cracked toilet valve that we did not. We have had experience with six different repair organizations since buying the bus, and this was in the top two for fast, fair, and painless service. 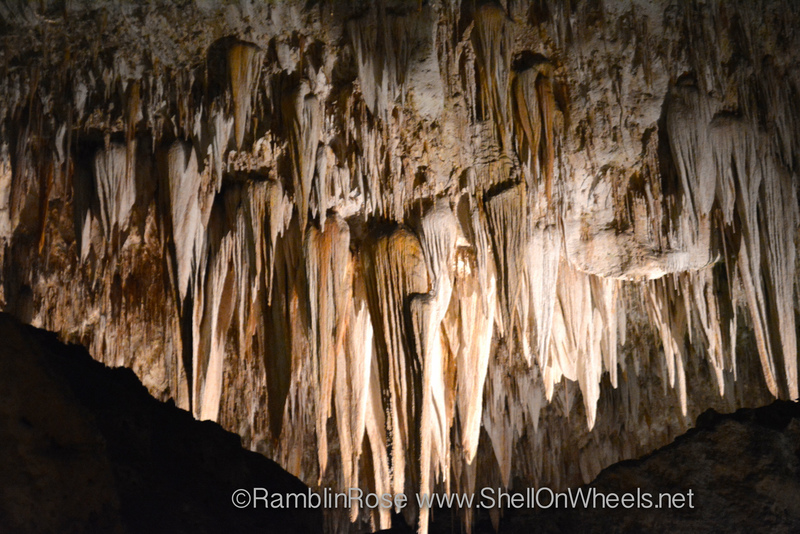 Shortly after 10 we were back on the road for the short trip back to the Carlsbad Caverns National Park. The seven mile entry road is a twisty winding pleasure for the passenger and not too difficult of an experience for the driver. The visitor center has ample bus and RV parking, though part of the lanes are not particularly level and unless you have an excessive amount of faith in your parking brake, wheel chocks are recommended to prevent catastrophe. I used two big rocks. We checked into the visitor center and learned that as it is Spring Break season all of the guided tours are filled up days in advance, but we preferred a self guided tour in any case, particularly since they had a portable audio guide to rent for $5. 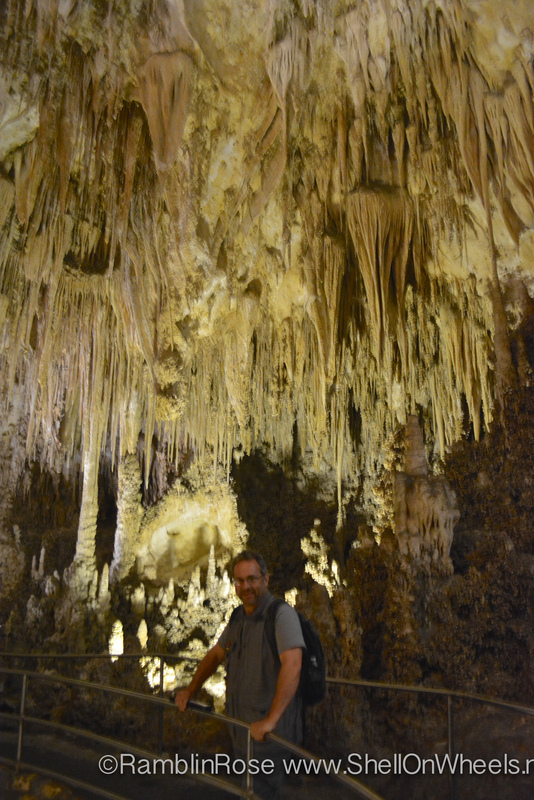 We used our National Park Annual Pass for free entry to the cavern itself, which if anyone is keeping track has now covered $50 of it’s $80 cost ($20 at Big Bend, $10 at Guadalupe Mountains, and $20 at Carlsbad). We were a bit concerned about the number of people in the park, particularly the busses full of children, but the park does a great job of spreading everyone out, and since we did the longer tour starting at the natural entrance, we did not find the crowd disconcerting at all. We did the slightly more than a mile hike from the cave entrance down to the primary viewing areas, another 1.2 mile circuit of the “Big Room,” and then took the elevator 750 feet back to the surface. It is difficult to explain just how overwhelmingly enormous this cavern is. 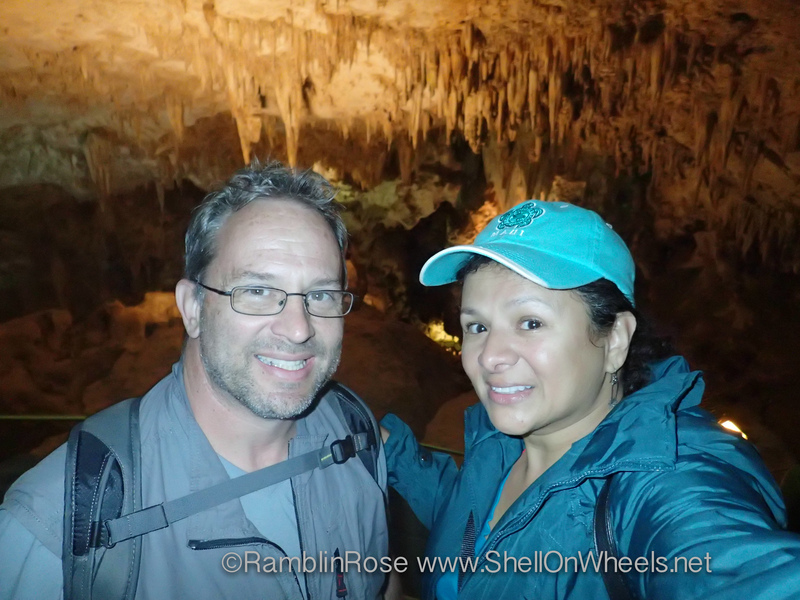 We visited Florida Caverns State Park earlier this year, and it was nice. It was interesting and fun. But to compare that cavern to Carlsbad is to compare a children’s flag football game to the Super Bowl. Sure, you might enjoy them both, but let’s be serious about which one is the national wonder and which one is merely interesting. The tour was longer and more energy consuming than we had anticipated, and thus we were ravenous enough to pay the extortionist prices at the visitor center cafeteria once we emerged topside. The gift shop and separate library gift shop were pretty big compared to our previous national park shops, and we snagged my park patch and some post cards. 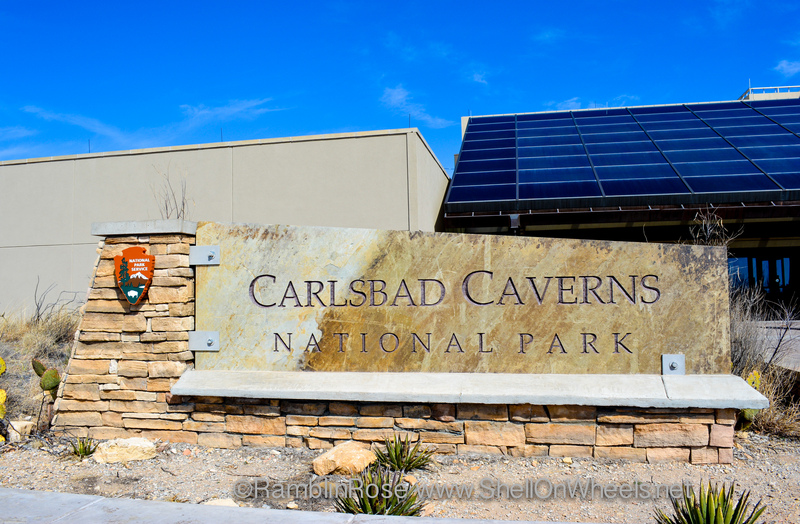 One of the key lessons from Carlsbad is that not all national parks are equal in terms of appropriate time to spend in them. We had sort of gotten used to the idea that in very general terms, state parks are small, i.e., you can often see the high points by bicycle in one or two days, and national parks are huge, i.e., you can’t expect to see but a fraction of their wonders in less than three days and that with a vehicle. So we had roughly penned in three days for any national park we planned to visit. This just isn’t necessary for Carlsbad. 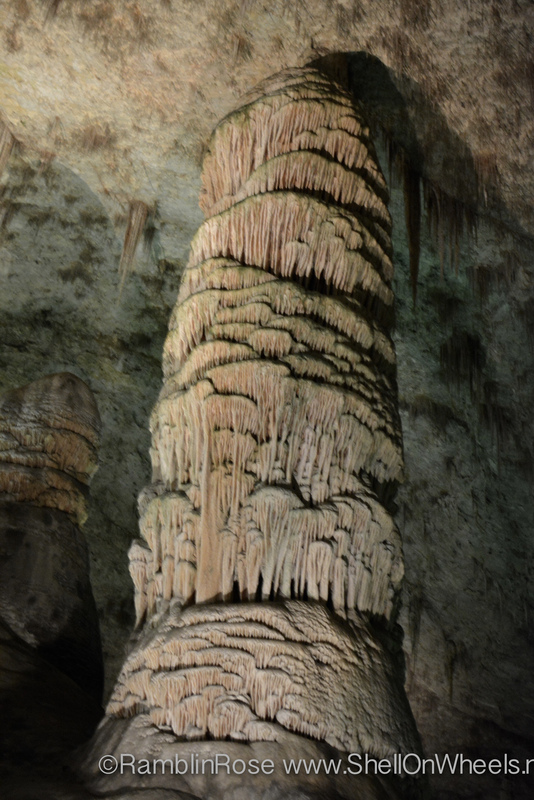 Unless you want to do the cavern tour multiple times or can arrange a tour of some of the other caverns in the area, you can do Carlsbad’s main attraction in half a day, particularly since this is one of the national parks that does not have any overnight RV camping available within the park itself. Once all of this became apparent we cancelled our plans to stay at the nearest private RV park and left right after our post hike meal, heading up the road to Roswell. Since that visit we have taken a harder look at a few other planned stops, such that the soon to be visited Petrified Forest National Park, which will now be a one night stop vice three. Awesome pictures of the caverns!!! Thank you for sharing! Thanks, but they don’t do the cavern justice. great to have met you and Randy in Roswell. Hope we can keep in touch.